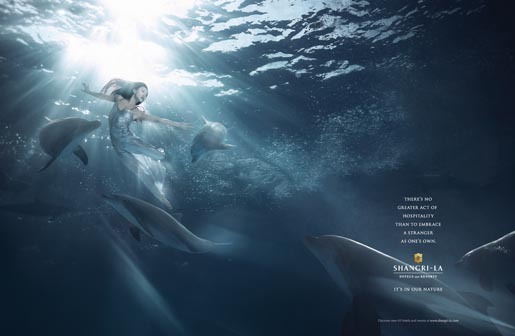 Shangri-La Hotels and Resorts, the international hotel chain based in Hong Kong, ran an integrated advertising campaign with the tag line, “It’s In Our Nature”, expressing the hotel’s distinctive philosophy of hospitality lived out over 40 years. The campaign takes the viewer to epic locations to communicate a simple, universal truth – “There’s no greater act of hospitality than to embrace a stranger as one’s own.” The television commercial at the heart of the campaign introduces us to an exhausted traveller alone in an overwhelming and unwelcoming landscape. As night falls and the traveller gives into exhaustion, the wolves appear, not to add to his danger, but to live over him in order to give him warmth, embracing a stranger as their own. Inspired by conversations with thousands of employees, partners and guests, the campaign focuses on the essence of the Shangri-La culture ‘embracing people from the heart and treating them like family’. “What is truly distinctive about the kind of Asian hospitality that Shangri-La offers is our colleagues’ genuine care and respect for our guests and each other. For us, this is more important than talking about palatial buildings or beautiful locations, which is why we choose this dramatically different and powerful style of campaign. It conveys the value of genuine kindness, something that is very relevant in today’s society,” said Greg Dogan, president and CEO of Shangri-La Hotels and Resorts. The television advertisement was launched as a 90-second film, followed with a 60 and 30 second cut down versions for television, in-flight, online and cinemas. A three-minute version is available online at www.shangri-la.com. 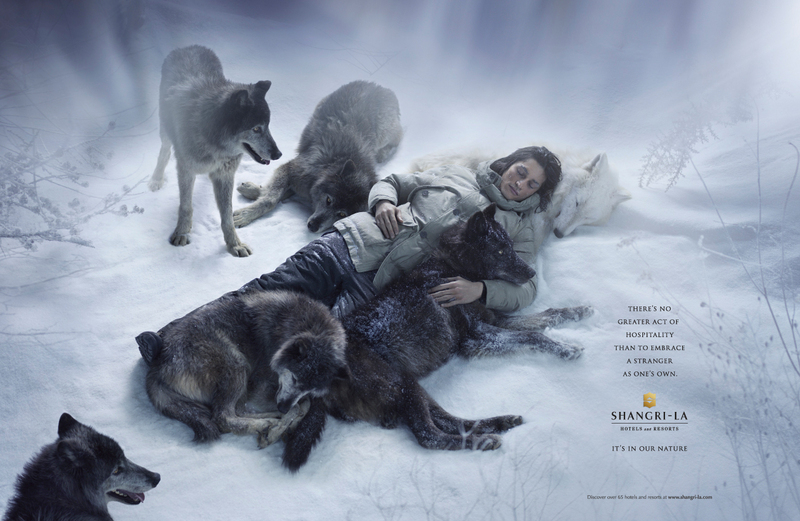 The campaign includes a set of magazine advertisements, featuring wolves, dolphins and a swan. Post production was done at Wizz, Paris, by editor Fred Olszak and producer Francois Brun. Sound was designed and arranged at Chez Jean, with music composed by Bruno Coulais.